Mega Happy Hunter: House Is Up! Seeing the for sale sign in front of our house has been really weird. First, I'm really excited to get the ball rolling. We've been talking about moving for a year now, so it's fun to see it start to happen. Also the sooner it sells the sooner I get a new car, so I'm really looking forward to that. Second, I feel really anxious. This is just the first step in a series of stressful steps that require a lot of work, so I kind of have anxiety about the long road ahead and all the unknowns. I absolutely hate moving so I'm not at all jazzed about doing it two more times. Third, I'm sad. We live in a gorgeous home and we've made some good friends in the area. We aren't going far, but it'll be hard to leave still. I've refused to let myself think about that part but seeing the sign kind of brought it closer to the surface. I figure once everything is packed and we're leaving then I can let it hit me and have a good cry, then move on. I think heading back to my parents will be the hardest part. Not because living with them is bad, but because we will have left our home to live in someone else's -- I think emotionally that will be the hardest to deal with until we find another house and can start getting excited again. I keep telling myself to take it one step at a time and to not worry about that yet. The first step is to get it sold at a good price. 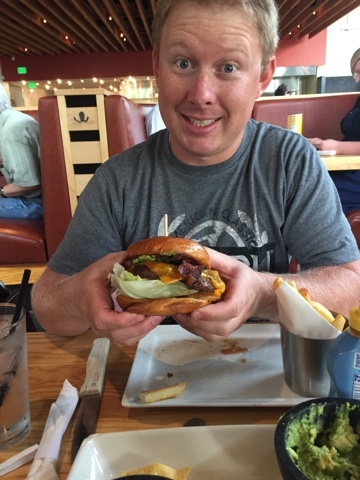 It was probably the most massive burger I've ever tried to eat. Cory got one, too. 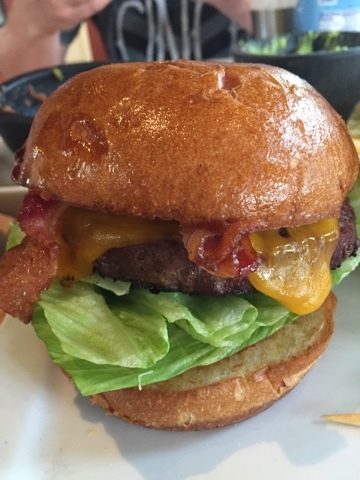 It was much, much too big and the buns were super greasy. (TWSS). But for real though, it was crazy huge. I only got through half of mine and I was sick the entire night. The. entire. Night. Cory thought it was really good, I didn't like it much. Kennedy got a pizza and that was super delicious. If we eat there again I will get the pizza. The fries were tasty, and that's saying a lot because I usually don't like steak cut fries. We also got the chips and salsa with guacamole appetizer and that was yummy in my tummy. Overall, a good restaurant. Expensive, but good. I thought for sure after that horrific dinner I was doomed for my workouts today. I was so sick with reflux all night and didn't sleep well. Plus my quads are TOAST! They are so sore right now. Monday and Tuesday have not been kind to my legs. Hell week has been no joke. Either way, I had a speed workout on the schedule and I was worried about being able to walk, much less run. But I got up and got it done anyway. I'm pretty impressed considering how much my legs hurt. 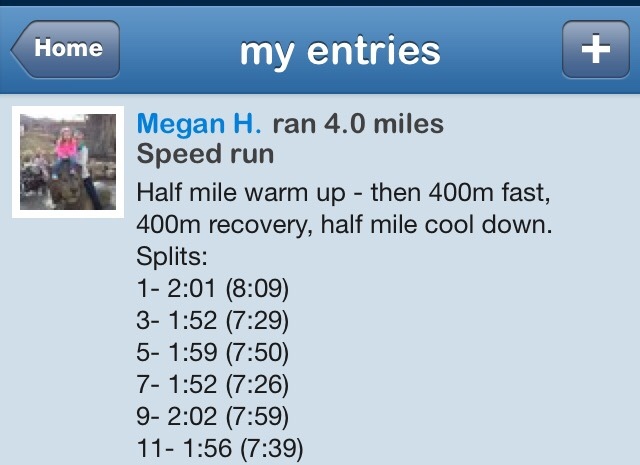 I had a 10:00 min mile average pace overall after the 400m recoveries and the warm up and cool down. I'm kind of new to this whole speed training thing, but I can already tell a difference in my pace. Then I hit the gym for another killer workout. Today's was a shoulder crusher, so my legs were spared more torture, but one particular exercise almost made me vomit and I literally couldn't move my arms afterward for a couple minutes. There was also an obscene amount of burpees and push-ups. Getting out of bed tomorrow should be lots of fun. We spent the rest of the day with good intentions to have fun together but it didn't happen. And then we ended up having our first showing so we retreated to me parents house to make dinner and play. 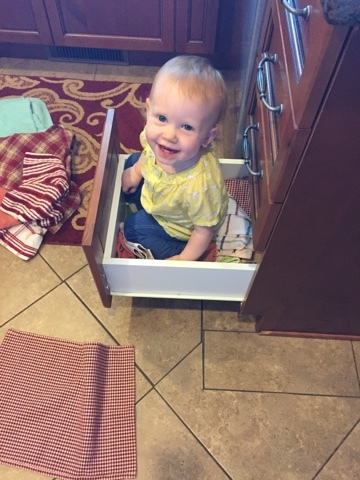 This one was in a surprisingly good mood considering she didn't nap at all today. At. All. Now it's time for Netflix and frozen custard. G'night!